Degas Sculptures presents a rare opportunity to view in a single exhibition all 73 bronze sculptures by the great French Impressionist master, Edgar Degas. The exhibition explores one of the most fascinating aspects of the work of this seminal painter and sculptor whose innovative compositions, skillful drawing and perceptive analysis of movement made him one of the late 19th-century masters of modern art. The only Midwest venue for the exhibition, the Milwaukee Art Museum has added nearly 20 of Degas' two-dimensional works, including important drawings, paintings and pastels. This is the first exhibition of French Impressionist works at the Milwaukee Art Museum. The exhibition is sponsored by Northwestern Mutual Foundation and Argosy Foundation. "The Museum is proud to bring the beauty of Edgar Degas' famous sculptures to visitors," said Milwaukee Art Museum Director and CEO David Gordon. "Museum-goers are sure to enjoy the breathtaking exhibition, enhanced only in Milwaukee by great Impressionist paintings, pastels and drawings." The collection of 73 sculptures in the exhibition comes from the Museu de Arte de Sao Paulo, Brazil, and is one of only four complete sets of the artist's bronzes in existence. 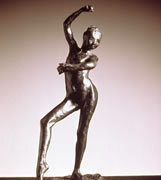 Featured among Degas' celebrated bathers, horses and dancers in Degas Sculptures is one of the icons of 19th-century art, Little Dancer, Aged Fourteen. This masterpiece was the only sculpture Degas (1834-1917) exhibited in his lifetime, when he included it in the sixth exhibition of Impressionist art in Paris in 1881. The provocative and groundbreaking mixing of media, with its surprisingly harsh realism, was not well received. Its rejection and condemnation by a number of prominent critics discouraged Degas from ever publicly showing sculpture again; however, sculpture remained a private life-long passion and pursuit known only to his friends and fellow artists. Pierre-Auguste Renoir proclaimed Degas "the greatest living sculptor," and Mary Cassatt asserted ".he will live to be greater as a sculptor than as a painter." This and other works in the exhibition demonstrate an unparalleled degree of experimentation and the use of advanced technology-including photography-and reveal Degas' innovative exploration of form and movement. Degas derived tremendous pleasure from the physical process of making these sculptures, which reflect his truly modern sensibility. For Degas, sculpture was an intimate medium akin to sketches or drawings that allowed him to explore the problems of form and movement that fascinated him. Upon Degas' death in 1917 more than 150 sculptures were found in his studio. The works, most of which were formed from clay and wax with wire skeletons, had reached various degrees of fragility. His heirs decided to authorize a series of bronze casts to be made from 73 of the small figurines. Paul-Albert Batholomé, a sculptor and longtime friend of Degas, prepared the sculptures for casting by the Paris foundry A.-A. Hébrard et Cie. The series was completed before 1921 when it was first exhibited in Paris. Nearly 20 two-dimensional works will be on view alongside the sculptures to allow visitors a glimpse at Degas' work through different media and to illustrate how closely much of his sculptural work was related to his experimental attitude toward movement and form and his better-known work as a painter. 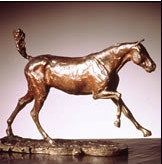 While there is general consensus among Degas scholars that the sculptures were not created simply as aids to painting, many of the sculpted dancers, bathers and horses can be related to similar subjects and compositions found among the artist's paintings and pastels. The addition of these objects to the exhibition allows visitors to examine them as part of an ongoing intellectual study of form and movement. What becomes clear in seeing the two- and three-dimensional works in comparison to each other is that Degas' sculptural studies were tools that helped him conceptualize the elaborate compositions that are found in his paintings and drawings. The exhibition is sponsored at the Milwaukee Art Museum by Northwestern Mutual Foundation and Argosy Foundation. Partial funding provided by an indemnity from the Federal Council on the Arts and Humanities. The exhibition is organized by Joseph S. Czestochowski and circulated by International Arts, Memphis, Tenn., from the Collections of MASP, Museu de Arte de São Paulo, Assis Chateaubriand, São Paulo, Brazil. The exhibition is coordinated at MAM by Laurie Winters, curator of earlier European art. The exhibition catalogue, Degas Sculptures, is edited by Joseph S. Czestochowski and Anne Pingeot. This 288-page hardcover book contains more than 300 illustrations, and is available in the Museum Store or online for $65/$58.50 members. 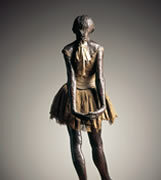 Edgar Degas, Little Dancer, Aged Fourteen, model: 1878-1881 cast: 1922-1937. Bronze, tulle skirt, satin ribbon. Collections of Museu de Arte de São Paulo, Brazil. Courtesy of International Arts, Memphis, Tennessee. Photo by Pierre-Alain Ferrazzini. 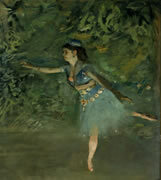 Edgar Degas, Dancer on the Stage, ca. 1877-80. Oil on canvas. Smith College Museum of Art, Northampton, Massachusetts, Gift of Paul Rosenberg and Company, 1955. Edgar Degas, Horse Galloping on Right Foot, modeled 1889/90. Bronze. Collections of MASP, Museu de Arte de São Paulo, Assis Chateaubriand, São Paulo, Brazil. © 2004 Courtesy of International Arts, Memphis, Tennessee, Photo by Pierre-Alain Ferrazzini. Edgar Degas, Spanish Dance, modeled 1883/85. Bronze. Collections of MASP, Museu de Arte de São Paulo, Assis Chateaubriand, São Paulo, Brazil. © 2004 Courtesy of International Arts, Memphis, Tennessee, Photo by Pierre-Alain Ferrazzini.